After the warming trend of 1000 AD came a colder period around 1300 AD called the Little Ice Age. Again, people felt the effects around the world. In Central Asia, the Mongols rose to power in the late 1200s AD. They conquered China, Russia, northern India, and most of the Islamic Empire and united them into one huge empire. The Mongols weakened West Asia, but they made trade and travel easier. So now travelers and inventions like paper, movable type, compasses, and gunpowder traveled easily from China to Europe. In 1328, though, it turned out that all this traveling could also spread disease. The bubonic plague got started in China or Central Asia. It soon spread from one end of the Mongol Empire to the other. Then it reached Europe and North Africa on sailing ships. Millions of people died all over Europe, Asia, and North Africa. The Mongol Empire collapsed into many smaller countries. 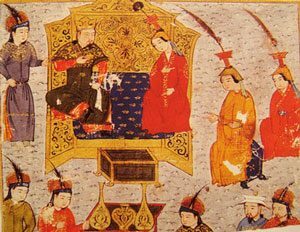 The Ming Dynasty took over China, and the Ottoman Empire got West Asia. Russia took Central Asia, and the Delhi Sultanate took India. In the 1400s, once the plague was pretty much over, the Mongols tried to put their empire back together. They had a new king, Timur. Timur conquered the Delhi Sultanate. He also took over much of West Asia, though he couldn’t take China again. Because the Ottomans had lost a lot of the eastern part of their empire to the Mongols, they conquered more land in the West, taking over Constantinople in 1453, and also a lot of Eastern Europe and North Africa. South of the Sahara, Islamic kingdoms flourished in Ghana and Mali, while along the east coast of Africa people traded with Islamic and Indian sailing ships. 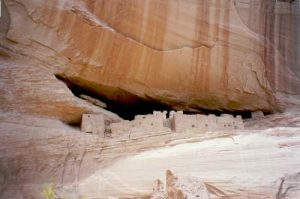 In North America, the Navajo moved south from the Great Plains into the southwest (modern Arizona) and took up farming corn and beans. The Pueblo people had to abandon land that had gotten too dry, and moved south-west into southern Arizona and New Mexico. The Iroquois moved north from Maryland up to New York, bringing farming with them and growing corn and beans, squash, sunflowers and tobacco. This move pushed the Algonquin further north into Canada. 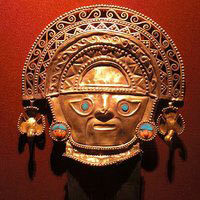 In South America, new empires emerged: the Inca in Peru, and the Aztec in Mexico, while the Maya and Zapotec continued to rule Central America. At the same time, the Europeans were pushing the Almohads out of Spain. The last Islamic rulers were forced out of Spain in 1492 AD, and in the same year Ferdinand and Isabella, the king and queen of Spain, sent Christopher Columbus to sail to North America. Cite this page: Carr, K.E. 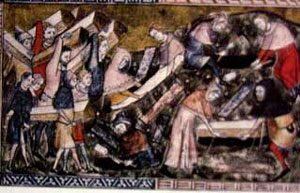 Late Middle Ages timeline – 1100-1500 AD. Quatr.us Study Guides, September 10, 2017. Web. April 18, 2019.